Oom Yung Doe offers balanced and complete mental and physical training for people of all ages, backgrounds and abilities. Some of the most important reasons to practice Oom Yung Doe include building inner strength, developing the immune system and preventing or treating illness. 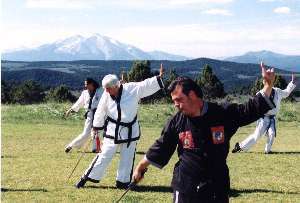 Practicing correct martial arts forms and movements provides incomparable stress relief and other health benefits difficult or impossible to find anywhere else. This allows for the development of skills and abilities necessary for the defense of health, freedom and peace of mind for yourself, your family and your community. These benefits and more are why correct martial arts has been for centuries an important part of the lives of billions of people. "At present, in many of the martial arts there is too much concern about appearance, and not much concern about substance. That kind of martial art is useless in critical moments." - Miyamoto Musashi, The Book of Five Rings, 1645. Miyamoto Musashi was a member of the elite Bushi class in feudal Japan. The only challenge to the power and authority of this ruling class came from another Bushi. Musashi and his fellow samurai were professional warriors, and a challenge between samurai often meant death. Fortunately, few of us today will find ourselves in a face to face confrontation with a samurai, one of the most deadly people alive, and literally face death. Why, then, are Musashi's words as important today as they were over three-hundred fifty years ago? We all face critical moments in our lives, and it is the substance taught in correct martial arts that can make the difference between happiness and failure. A critical moment may or may not be a life or death situation. It could be the closing of a business deal, a job interview, a mid-term exam or teaching children. A broader definition might include any situation or element that creates stress in our daily lives, such as traffic, physical pain or important relationships. Balanced martial arts training can help anyone increase their patience, focus, discipline and communication skills along with developing overall internal and external physical health. It is this combination of benefits which increases the success and enriches the lives of so many practitioners. An unfortunate image of the martial arts today is of the action hero or cartoon character doling out violence as justice. 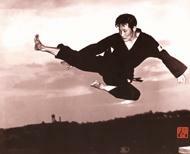 Other limited perspectives and misconceptions of martial artists include the reclusive fighter, the overconfident bully or the sweaty model/actor with an unnaturally small amount of body fat releasing aggression on a punching bag or sparring opponent. Although violence and its subsequent adrenaline may have their appeal, we feel these images are unrealistic and misleading. Correct martial arts training will develop the balanced physical and mental confidence that increase effectiveness in any situation while actually making the practitioner less likely to react to stress in a violent, negative or uncontrolled manner. This confidence also helps the Oom Yung Doe practitioner feel comfortable in his or her own body, in a more natural, healthy state of being. The result is a feeling of mental and physical harmony throughout daily life. The Oom Yung Doe Instructors of New Jersey believe that this mental (invisible) and physical (visible) harmony is one example of the "substance" declared so essential by Musashi. 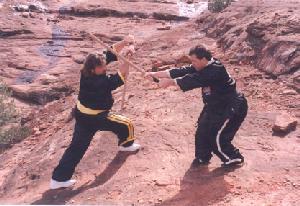 Developing and protecting this harmony through powerful, balanced forms and safe, effective self defense help define our goal as martial arts instructors. By practicing Oom Yung Doe you will learn how to challenge yourself mentally and physically, reaching toward your fullest potential. Overcoming these challenges and reaching personal goals will increase self-respect and happiness.